Currently, external grant funding is changing the landscape of both medical and non-medical research and development (NIH, 2016; NSF, 2016). 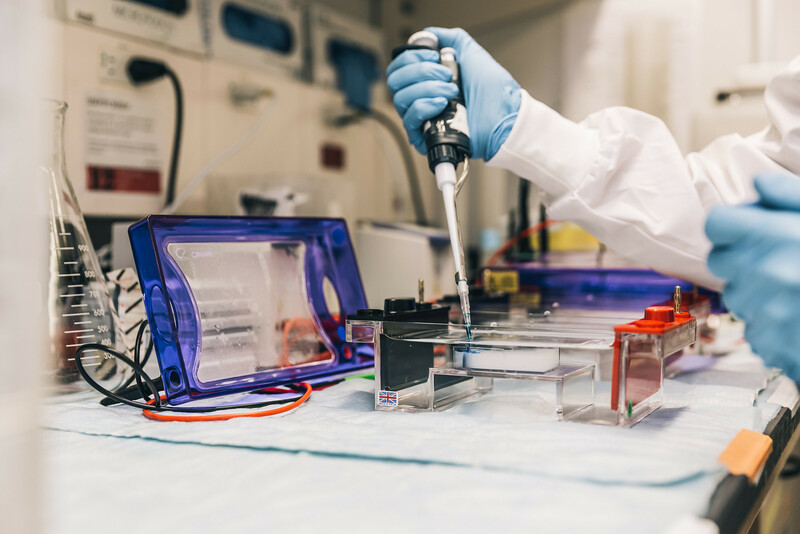 The technological advances and growth in fields such as: (a) engineering; (b) pharmaceuticals; (c) biomedical sciences; and (d) other medical and non-medical fields, are changing how research is performed, as well as the content of the studies. The opportunities for investigators to gain knowledge and information on specific areas and topics have expanded exponentially since the formation of organizations such as the National Science Foundation (NSF), that currently awards the most to campus-based research and development—$45 billion in 2008, to be exact (Bastedo, Altbach, & Gumport, 2016). The individual topic areas funded vary by foundation, however, the two most prominent grant funding organizations, the National Institutes of Health (NIH) and the NSF, clearly distinguish their areas of study. The NIH promotes the funding of these areas through grants: (a) medical, both physical and mental; (b) pharmaceuticals; and (c) any health-related area (2016). The NSF broadens the area spectrum to include non-medical research such as: (a) biological sciences; (b) computer and information science; (c) engineering; (d) education; (e) human resources; (f) geosciences; (g) mathematics; (h) chemistry; and (i) physics (2016). Currently, external federal funding only contributes about 10% of the overall revenue to moderate research higher education institutions, however, at some very prominent research universities external funding can deliver almost 25% of these same revenues. Support in this area is more than necessary to maintain current and future technological advances and increased research efforts to stay at the front of the grant-attaining pack. In 2006, the majority of federal research funding (~60%) went to the natural sciences (including physical sciences), while engineering only received approximately 15% of total funds. Support for the social sciences, between 1975 and 2006, decreased significantly from 7.5% of total funding to 3.6% (Bastedo et al., 2016). This research project was designed to determine what type of, and how much education grant seekers are receiving, and whether or not that influences their level of success as a grant writer. If attributes that contribute to successful grant proposals can be identified in connection with the preparation of the seekers, the outcome of the time-consuming grant proposal writing process may be improved to result in more awards, and fewer negative outcomes such as non-attainment, as well as the time lost spent preparing the proposal application. As mentioned in previous literature, there are many barriers to writing a successful grant proposal (Boyer & Cockriel, 1998; Monahan, 1993; Walden & Bryan, 2010), however, many of those barriers may be specific to the institutions involved in those studies and may have no effect on other higher education institutions. The current research study specifically focuses on the lack of education barrier that is prevalent in the literature on grant proposal writing. The outcomes of the study attempt to reduce the effects of this barrier on faculty, and remedy the apparent lack of education in grant proposal writing, while increasing the chances for grant attainment. Advances in technology and economic health are determined through faculty research at many higher education institutions nationwide (Decker, Wimsatt, Trice, & Konstan, 2007). Research funding often comes from external sources beyond the operational budget of the university. The application process for acquiring grants can be troublesome and difficult when faculty lack the skills and ability to apply successfully (Ludlow, 2014). Proposal education is important to the future of research as new and aspiring grant writers enter the faculty ranks with the expectation to learn on-the-job while maintaining and excelling at an already demanding workload (Kleinfelder, Price, & Dake, 2003; Kraus, 2007; Porter, 2007). The difficult nature of attaining external grant funding is shown in the 21% of proposals that were awarded in the 2009 fiscal year, according to the NIH (Dumanis, Ullrich, Washington, & Forcelli, 2013). The main goal of this study was to determine whether, and how, higher education faculty members have been educated on how to seek out and apply for external grant funding, and whether or not the discipline they specialize in encourages formal versus informal grant proposal writing education for faculty members. By formally educating our new and existing faculty in the skillful art of grant proposal writing, institutions may increase the potential for successful attainment of grants. The purpose of this study was to understand the current climate of higher education grant writing at a national level by surveying faculty on their education of proposal writing preparation. This research study employed an embedded research design; this is a mixed-methods approach in which both quantitative (multiple linear regressions and one-way ANOVA) and qualitative data (open-ended questions) were collected simultaneously and analyzed; the qualitative follow-up to the quantitative data for further support and enhancement of the quantitative data is required (Creswell & Plano-Clark, 2011). There were multiple independent and dependent variables in this study. The independent variables were: (a) formal education on grant proposal preparation; (b) informal education on grant proposal preparation; and (c) the faculty members’ discipline. The dependent variables in this study were: (a) proposal preparation level; (b) success; (c) failure; (d) formal education on grant proposal preparation; (e) informal education on grant proposal preparation; (f) amount of funding attained; (g) encouragement/confidence level; and (h) the effect on Sponsored Programs departments. The participants were full-time, grant-seeking faculty members at Research Highest (R1), Research Higher (R2), or Research Moderate (R3) Doctoral Universities (Carnegie Classification, 2016). This study employed a census approach to survey the most university faculty possible from fully accredited R1, R2, or R3 doctorate-granting institutions according to the Carnegie Classification and organized regionally through CHEA (2016). The institutions were purposefully selected under three criteria: (1) two institutions were chosen from each of the seven regional accrediting organizations (minus the ACCJC, which does not meet minimum criteria); (2) one institution was public, the other institution was private; and (3) there was an equal number of R1, R2, and R3 universities in the sample. The email addresses of all faculty members of the chosen institutions were manually collected by the researcher via each institution’s faculty directory list (approximately 3,700 faculty emails were collected and were sent a link to the survey). The process began by distributing the survey using the Qualtrics survey platform. The survey employed different types of question structures and concluded with an open-ended question/answer section to collect the qualitative portion of the research. This allowed the researcher to gain more insight into the personal experiences of the participants while collecting pertinent information for the study (Baumgartner & Hensley, 2006). Once Human Subjects Committee approval was gained, a pilot study was conducted using the survey to ensure question clarity and understanding. No major adjustments were made resulting from the pilot study, therefore there was no need to submit any alterations to the Human Subjects Committee. Participants were then contacted via email to complete the survey (all participants were randomly selected from the compiled email lists of included institutions). The final questions in the survey were open-ended and required qualitative analysis. Once the survey was complete, the open-ended portions were extracted and analyzed using a general inductive approach to qualitative data (Thomas, 2006). The quantitative data were analyzed and reported utilizing descriptive statistics including (a) response frequencies; (b) corresponding percentages; and (c) measures of central tendency. Because this study has multiple independent and dependent variables, such as the relationship between formal and informal education within areas of study, and potentially years of professional teaching experience as well as success versus failure of grant attainment and procurement, the testing of multiple variables was conducted using Linear Regressions (see Figure 1) and a statistical analysis of One-Way ANOVA was performed on formal education being the “norm” in the faculty members’ discipline, and in which discipline the faculty member currently taught. These statistical tests were used to determine whether formal or informal grant writing education had an effect on perceived success or failure, or additionally, other dependent variables of the study. The respondent’s discipline was also used as a variable to determine whether the relationship existed between formal or informal training in specific disciplines within higher education institutions. Multiple regression models were designed to measure the effects of the independent variables in predicting the dependent variables (e.g., confidence and preparation level). The qualitative analysis was based on the narrative data extracted from the open-ended question section of the survey. The analysis of the qualitative data followed the General Inductive Approach described by Thomas (2006). The data were collected verbatim and read by multiple researchers (triangulation) to develop categories and themes using open coding. The data were re-read and categories were assigned to all data units (Thomas, 2006). Categories were organized into key themes and subthemes. The key themes, and the connections among them to support the quantitative data, were reported and supported using appropriate quotations from the transcribed data. The themes and connections were used to address, and to help answer, the research questions. The major delimitation to this study was the use of only full time, grant-seeking faculty members. The inclusion of adjunct, or part-time, faculty or other non-faculty grant-seeking individuals could have resulted in a different outcome, or potentially a much higher response rate, increasing the ability to generalize to the overall population. The population not included in this study may also have had important contributions to grant proposal education techniques as this topic expands on a national level. Of the respondents who completed the survey, 47.4% were female (n = 18), while 52.6% were male (n = 20). Faculty rank resulted in the following distribution: (a) Assistant Professor, 18.4% (n = 7); (b) Associate Professor, 31.6% (n = 12); and (c) Professor, 50.0% (n = 19). When asked if the participating faculty member had a primarily “clinical” or “research”-related component to the faculty appointment, 39.5% responded “no” (n = 15); the remainder of the sample, 60.5% (n = 23) responded “yes, research.” No participants in this study responded “yes, clinical”. The researcher inquired about tenure status. Only two of the 38 participants (5.2%) responded to the non-tenure track option, while 7 participants (18.4%) were currently on the tenure-track at their respective universities. 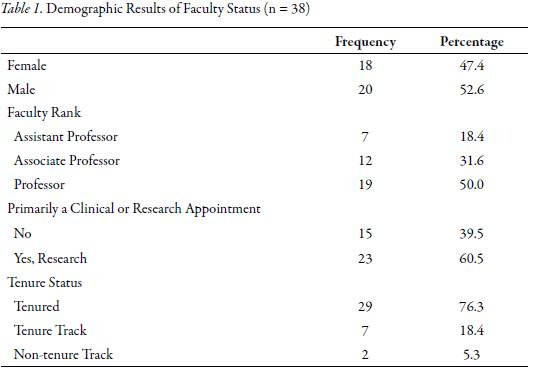 The majority of the responding participants were already tenured faculty members (76.3%; n = 29) (see Table 1). The regression analyses indicated 43 statistically significant results (p ≤ .10), and over 200 insignificant relationships between independent and dependent variables for this study. According to Borg and Gall (1989), most educational studies use p ≤ .05, however “exploratory studies may use an accepted value of ≤ .10” (p. 351). In regression analysis, the regression model strives to produce a high R-squared value paired with a significant p value (p ≤ .10). This low p value / high R2 combination indicates that changes in the predictors are related to changes in the response variable and that your model explains a lot of the response variability (Creswell & Plano-Clark, 2011). The results of the multiple linear regressions showed significant relationships among area of education regressed on: (a) conducting original research as a requirement during undergraduate education (R2 = .134, p = .014); (b) formal education being the “norm” in the faculty members’ discipline (R2 = .179, p = .005); (c) formal workshops being most helpful to faculty members when writing a grant proposal (R2 = .027, p = .169); (d) informal education through “learn as you go” or “trial and error” processes making a faculty member feel confident about grant proposal preparation (R2 = .122, p = .018); and (e) informal situations being most helpful when preparing grant proposals (R2 = .141, p = .012). From these results, one can conclude that the discipline has a significant relationship to how the faculty member is educated (whether formally or informally), and what they believe and feel is most helpful to them in grant proposal preparation situations. The results of the multiple linear regressions of formal education factors showed various statistically significant relationships. Among them, formal education of preparing a mock grant proposal during the master’s degree program regressed on how often faculty members look for grants to apply to (R2 = -.088, p = .079). 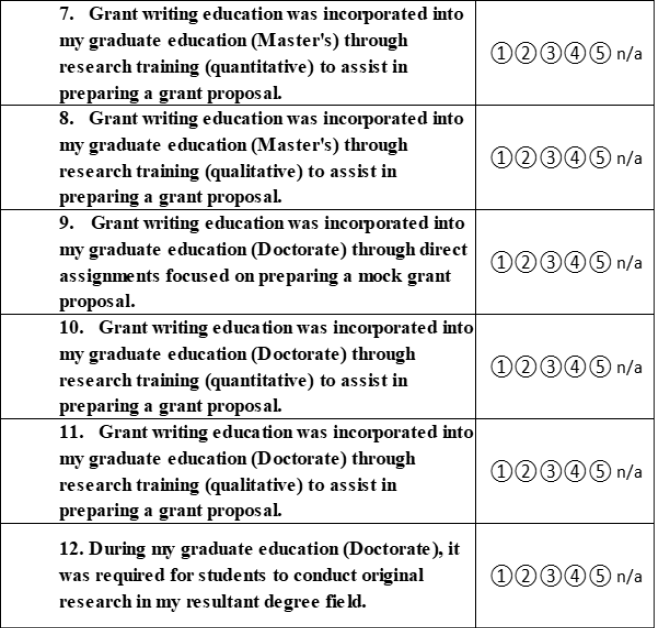 As far as applying for the actual grants, significance was found when faculty members were: (a) educated during their undergraduate education through actual grant proposal preparation (R2 = .265, p = .003); (b) educated during their doctoral program by conducting original research (R2 = -.010, p = .071); and (c) when the faculty member had to write a proposal for completion of the terminal degree (R2 = -.010, p = .064). This demonstrates that education in a formal setting may promote a faculty member to apply for more grants than those not educated formally. Regarding the confidence level of the faculty members (participants), the most significant results arise from many of the formal education factors. Faculty members gained a high level of confidence for preparing grant proposals when they were prepared formally through: (a) undergraduate education when grant preparation was part of the assignment (R2 = .284, p = .086); (b) undergraduate education when involved in a quantitative research class (R2 = .284, p = .039); (c) master’s level education when they were required to conduct original research (R2 = .205, p = .028); (d) master’s level quantitative, as well as qualitative research courses (R2 = .274, p = .074, p = .063, respectively); (e) graduate level courses devoted to grant proposal preparation (R2 = .220, p = .090); (f) doctoral level courses in which mock proposals were a requirement (R2 =.205, p = .027); and the most common result, (g) when formal education was the “norm” in that faculty member’s discipline (R2 =.274, p = .006). The results of the regressions on formal education factors show the importance related to how confident the participants were about preparing grant proposals. Funding source seminars provided by the NIH, NSF, USDA, NEH, etc. also allowed faculty members to experience confidence when they were formally educated previously through: (a) undergraduate courses that involved mock grant proposal preparation (R2 =.220, p = .043); (b) a terminal degree requirement to prepare a grant proposal (R2 =.220, p = .090) and (c) when they previously attended a helpful formal seminar provided by those same funding sources (e.g., NIH, NSF, USDA, NEH) (R2 =.220, p = .057). Finally, significance was demonstrated for the encouragement level of the faculty members due to a funding source seminar provided by the NIH, NSF, USDA, NEH, etc. when: (a) faculty members were educated in an undergraduate quantitative research course (R2 =.255, p = .060); (b) formal education was the “norm” in the faculty members’ discipline (R2 =.255, p = .025) and (c) when they previously attended a helpful formal seminar by those same funding sources (e.g., NIH, NSF, USDA, NEH) (R2 =.255, p = .078). Informal education factors were also regressed against various grant proposal preparation factors. No significant results were displayed among any of the informal education factors and grant proposal preparation level of the faculty members, however, there was a significant relationship with being informally educated and the number of grants applied for, as well as total dollars attained through external grant writing (R2 = .284, p = .004, R2 = .267, p = .006, respectively). Regarding the confidence level of the participants of this study, participants who experienced grant writing education during their graduate degree showed a significant relationship with informal situations being quite helpful to them in preparing an actual grant proposal (R2 =.039, p = .066). Another significant statistic emerged when informal situations were helpful to those who had experience with funding source seminars (e.g., NIH, NSF, USDA, NEH) (R2 =.050, p = .071). This combination of experiences (informal and formal) was pertinent throughout the open-ended response section of the survey. Regarding the relationship between Sponsored Programs offices and the effect, if any, they had on informal education factors, demonstrated very little statistical significance; except for the “learn as you go” or “trial and error” factor. This element showed significance when paired with faculty members who considered grant writing assistance through the Sponsored Programs office to be helpful (R2 =.076, p = .043). According to the qualitative portion of this study, there were five major themes with various supporting subthemes, according to the triangulation and development of themes through the process of General Inductive Theory. The major themes included: (1) formal education opportunities for grant proposal preparation; (2) informal education opportunities for grant proposal preparation; (3) motivators to prepare grant proposals for research purposes; (4) barriers to prepare grant proposals for research purposes; and (5) types of grants sought by faculty members. Overall, the results of this study determined that faculty are educated both formally and informally in various settings, the discipline was significantly related to type of grant proposal education received, and informal education, rather than formal grant proposal preparation, tended to be more successful in number of grants and total dollars attained for this sample of the population. The following questions guided this study: (1) To what extent are faculty members educated on the grant writing process? ; (2) Does formal grant education contribute to the success level of grant acquisition in terms of the numbers of grants submitted and received? ; (3) Does the discipline influence whether faculty members are formally or informally educated on grant writing? 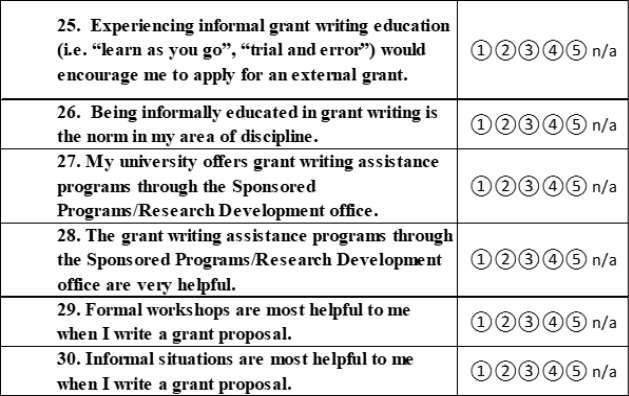 ; and (4) Does formal or informal education on grant proposal writing affect the amount of funding faculty seek out and attain? 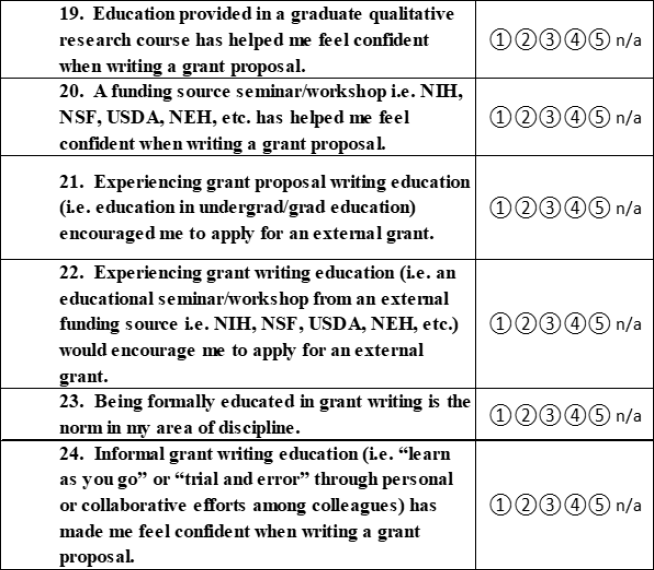 To what extent are faculty members educated on the grant writing process? According to the results of this study, faculty members, depending on discipline, were educated both formally and informally, through various undergraduate and graduate courses, as well as through funding source seminars provided by the NIH, NSF, USDA, NEH, etc., “learn as you go,” “trial and error,” and collaborative situations. Neither type of education was determined to be better or more beneficial than the other, and in some instances, both were mentioned together. According to the responses, faculty in the natural sciences were often more formally educated than those in other disciplines, but responses showed varying levels of education among all disciplines. The descriptive statistics and the qualitative, or open-ended portion of this study, showed that many of the faculty members were older and had either not had the opportunity to experience formal grant proposal education through their undergraduate or graduate degrees and gained experience by learning on the job as grant writing became more common in higher education. Some participants described undergraduate and graduate education experiences through different courses and/or requirements within their academic careers. The findings of the current study contradict the findings of previous literature (Kraus, 2007; Medina-Walpole, Barker, & Katz, 2004). Does formal grant education contribute to the success level of grant acquisition in terms of the numbers of grants submitted and received? There was no significant or outstanding relationship, according to the statistical analysis, that determined formal education as a more successful route to grants submitted or received. In some instances, in fact, according to this research study and the statistical analysis of attainment and total dollars attained, informally educated faculty members were just as, if not more successful than their formally educated counterparts. Does the discipline influence whether faculty members are formally or informally educated on grant writing? In simple terms, yes, the discipline had a significant relationship to the type of education received by the faculty member in this study. According to the one-way ANOVA performed (p = .038), faculty members who resided in the “hard sciences” (e.g., biochemistry, biological sciences, ecology, health professions, neuroscience, physiology, and animal science) considered being formally educated the “norm” in their disciplines. According to Arlitsch (2013), “Grant funding supports universities and academic faculty, particularly in the hard sciences…” (p. 370). While faculty in other disciplines do pursue external grants and strive for more formal education, the idea that faculty in the hard sciences are more commonly educated in grant proposal preparation is not a newfound concept (Blankenship, Jones, & Lovett, 2010; Drotar et al., 2015; Seifried, Walker, Forman, & Andrew, 2015). Does formal or informal education on grant proposal writing affect the amount of funding faculty seek out and attain? Formal education factors showed no significant relationship with how often grant opportunities were sought out by the participants. However, the formal factor of grant writing education incorporated into a master’s program through mock grant proposal preparation did show significance with seeking out grant opportunities. Receiving education during the undergraduate program through mock grant proposals showed a strong relationship with actually applying to the grant opportunities sought out by faculty members. This shows that formal education may help better prepare the grant seeker to actually submit a grant proposal for external funding. Statistical significance was demonstrated through regressing grant proposal education during the doctoral program through conducting original research and writing a grant proposal as part of the terminal degree when regressed on how many external grants the participant has applied for since becoming a full-time faculty member. No significance appeared in the total dollar amount attained for any of the formal education factors. Regarding the informal education factors of “learn as you go” or “trial and error” learning situations, significance was demonstrated when grants were sought out, applied for, and/or attained. As far as total dollar amount attained was concerned, significance was seen in the “learn as you go” or “trial and error” situation. No current literature has explored this concept, nor represents this finding; it is an original result and is unique to this research study. Due to the results of this study, there were some recommendations for future researchers when it comes to exploring the barrier of lack of education to grant proposal preparation. Including all levels of faculty in the study, not just those with a grant-seeking component to their scholarship duties, may have resulted in a higher response rate (= 1.05%) with more widely varying experiences on grant proposal preparation. Future research on grant proposal preparation should examine all faculty levels and other grant-seeking (non-faculty) departments in order to produce a wider variety of responses. Viewing the grant proposal process from the administrative perspective and how to best organize faculty positions and responsibilities should also be explored in further detail to promote the seeking and attainment of grant funding. The quick glimpse at Sponsored Programs offices that this study provided could be explored in more detail, as well. Some of the responses of participants demonstrated the assistance provided by Sponsored Programs offices for grant proposal preparation as quite lack-luster. By exploring how much these offices actually assist (or rather, do not assist) faculty members at the university level, potential increases in the support provided to grant-seekers to increase research activity could be attained. This increase in support may also assist more faculty in exploring the opportunity to prepare a grant proposal for external funding, thereby increasing their professional portfolios, as well as increasing the funding in their respective department and university. Interaction from the Sponsored Programs offices in universities, especially incorporated into the classroom, could potentially increase the seeking and applying components to grant proposal writing. As a result of this study and consistent with the literature (Blankenship et al., 2010; Cole, Inada, Smith, & Haaf, 2013; Gaugler, 2004; Kleinfelder et al., 2013; Reed, Kern, Levine, & Wright, 2005), it is recommended that faculty consider including grant proposal opportunities in their curricula, especially at the Masters and Doctoral levels, to better prepare future faculty. While formal education can assist in preparing the faculty member for the grant application process, the timing and availability of funds, dependent upon the discipline, should also be taken into consideration; being prepared is important, but if money is not available, grant attainment becomes quite difficult. 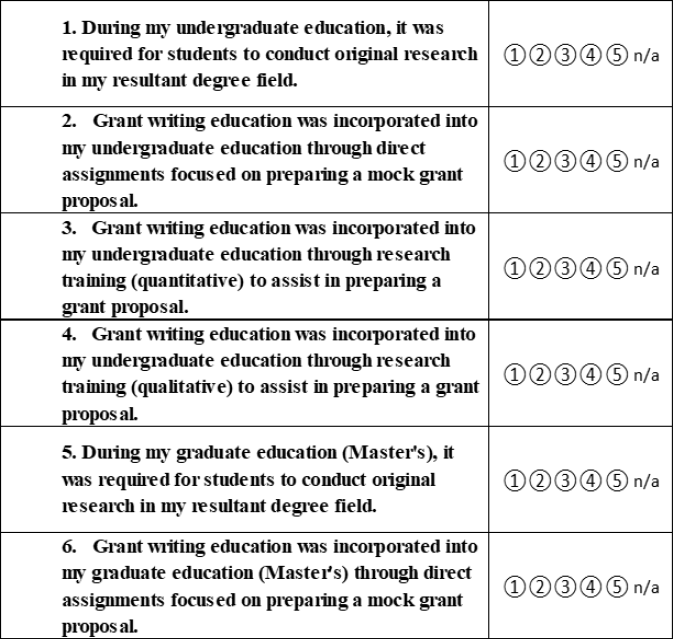 Faculty members who can potentially achieve reviewer status (of grant proposals) could gain quite a bit of experience on the grant application process for future research of their own. Last, the remaining barriers identified by this and other research studies could use more exploration, as well (Monahan, 1993; Dooley, 1995; Boyer & Cockriel, 1998; Walden & Bryan, 2010). These barriers include: (a) a lack of time due to teaching, advising, service, and other aspects of scholarly duties; (b) a lack of advance notice of available grants to pursue; (c) seeking external funding sources; (d) preparing proposals and budgets; (e) getting necessary approvals; and (f) dealing with campus business staff (distribution and management of funds). Motivators are also very important to focus on to continue the process of seeking and applying for grants. Yet, if the barriers could potentially be reduced and/or eliminated in some universities, grant proposal preparation may possibly increase along with research efforts by all levels of faculty. Dr. Kristin M. Shuman is currently employed as an Assistant Professor of Exercise Science at Concordia University Ann Arbor. This manuscript was derived from the author’s Doctoral Dissertation which was successfully presented and defended in April 2017 at Idaho State University in Pocatello, Idaho. Arlitsch, K. (2013). Committing to research: librarians and grantsmanship. Journal of Library Administration, 53(5-6), 369-379. https://doi.org/10.1080/01930826.2013.876828. Bastedo, M. N., Altbach, P. G., & Gumport, P. J. (2016). American higher education in the twenty-first century: Social, political, and economic challenges (4th ed.). Baltimore: The Johns Hopkins University Press. Baumgartner, T., & Hensley, L. (2006). Conducting and reading research in health and human performance (4th ed.). New York, NY: McGraw Hill. Borg, W. R., & Gall, M. D. (1989). Educational research: An introduction. New York: Longman. Boyer, P., & Cockriel, I. (1998). Factors influencing grant writing: Perceptions of tenured and non-tenured faculty. SRA Journal, 29(Spring), 61-68. Creswell, J. W., & Plano-Clark, V. L. (2011). Designing and conducting mixed methods research. Thousand Oaks, CA: Sage Publishing, Inc.
Dooley, L. M. (1995). Barriers and inducements to grant related activity by a College of Education faculty. Research Management Review, 7(2), 10-24. Monahan, T. C. (1993). Barriers and inducements to grant-related activity by New Jersey State College faculty. Society of Research Administrators Journal, 24(4), 9. Porter, R. (2007). Why academics have a hard time writing good grant proposals. Journal of Research Administration, 38(2), 37-43. Seifried, C., Walker, K., Forman, J., & Andrew, D. (2015). A definition of grant writing and the promotion of its pursuit for sport management. Journal of Contemporary Athletics, 9(3), 181-193. 3. Is your faculty appointment primarily Clinical or Research? 5. Do you have a grant seeking component to your workload? How many hours are required of your overall workload? 6. Graduate degrees earned? Check all that apply. 9. How many external grants have you applied for since you became a full-time faculty member? 10. How many external grants have you been awarded since you became a full-time faculty member? 11. How much total money have you acquired through successful external grant applications? 12. How often do you look for grants to apply for? 13. How often do you apply for the grants you find? Below are statements with which you may agree or disagree. Using the five point scale below, please indicate your level of agreement with each item. What types of grant writing education have you participated in (internal, external, competitive, non-competitive)? What value did it have, if any? When applying for an external grant, do you consider the type of grant (non-competitive vs. peer-reviewed/juried) before preparing a proposal? Is one more attractive than the others? Why or why not? How many grants have you received as a student? How many grants have you received as a faculty member? What are the barriers, if any, that prevent you from preparing external grant proposals? What are the motivators, if any, that promote you to prepare external grant proposals? Do you feel prepared from your undergraduate and/or graduate education to create a grant proposal for external funding? Why or why not? How do you define “success” in regard to writing grant proposals? 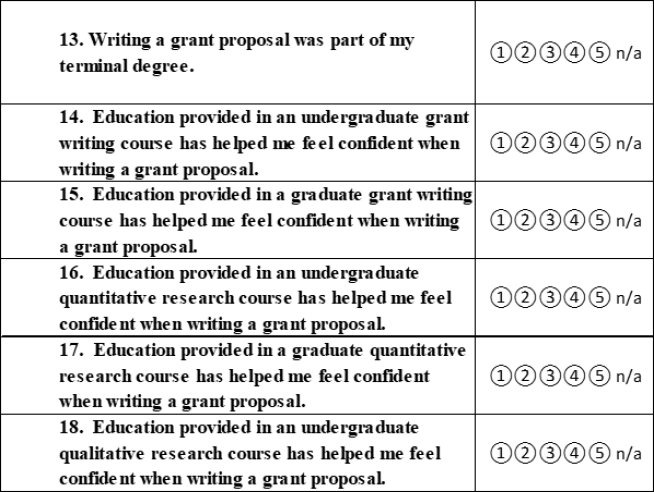 How could you have been better prepared for the expectation of grant proposal writing at the university level? Would you like more opportunities to formally learn how to prepare a grant proposal? If so, what types of opportunities would you benefit from most? What additional comments do you have regarding grant proposal preparation?